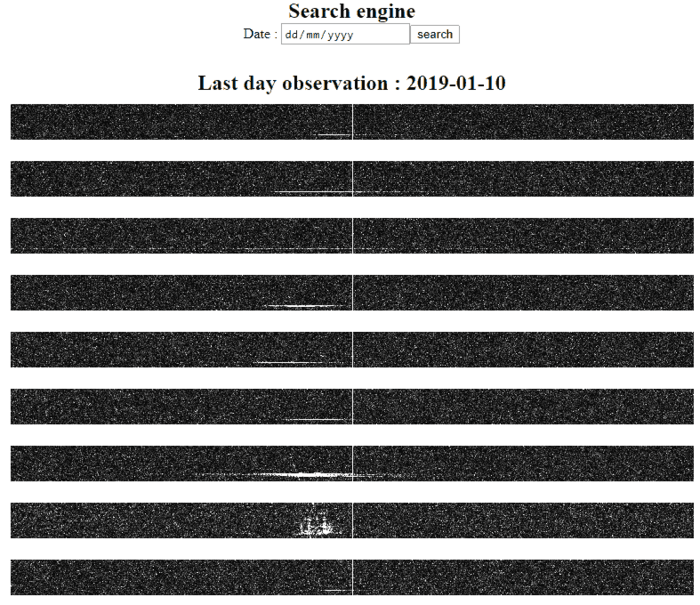 Thank you to Florent for submitting his website which contains a live log of his meteor scatter observations. Meteor scatter occurs when radio signals reflect off the ionized trail left behind by meteors when they enter the atmosphere. This trail is highly RF reflective, so it can allow distant radio stations to be briefly received. His set up consists of an RTL-SDR dongle running on a Raspberry Pi 3. His antenna is a homemade 6 element Yagi. Florent is based in France and listens for reflections from the Graves radar at 143.05 MHz. His software captures 768 Hz worth of bandwidth every 0.5s, and then uploads and displays the spectrum plot on his website. When the Graves radar signal is visible on the spectrum, it is an indication of a meteor having entered the atmosphere (or possibly an aircraft). If you are interested in other peoples live meteor scatter streams, then there is another site at livemeteors.com which displays a live video of an SDR# screen looking for meteor echoes.